Chronopia: Sons of Kronos Hunter, Barbarian and Blade Maiden. | Azazel's Bitz Box. 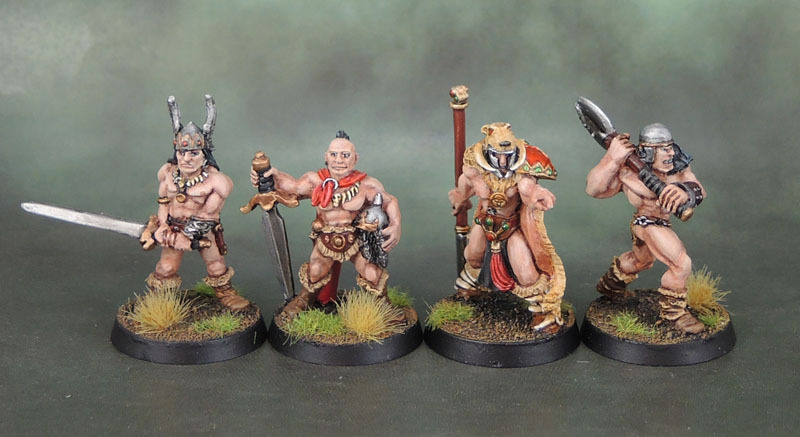 This entry was posted in General and tagged Black Tree Design, chronopia, Citadel F3 Barbarians, Harlequin Miniatures, Heartbreaker Models, HM1058 Brabarian Fighters II, Kronos Barbarian, Kronos Blade Maiden, Kronos Hunter, Oldhammer, Sons of Kronos. Bookmark the permalink. Nice looking models! The female and the cloaked male are my fave. Yea, I noticed right away that the skin tone was a bit more orange. What were you using for skin back then compared to what you use now? 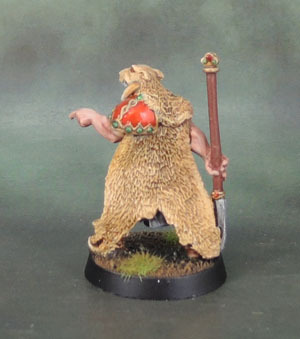 My older “standard” way to do skin was to start with Citadel’s Dwarf Flesh, shade with Swamp Brown (or whatever chestnut-type colour was to hand), bring back up to Dwarf Flesh, then go to Elf Flesh for the highlight. I think these two might have gone to Bronzed Flesh instead of Elf Flesh, and she’s clearly got a pinkish flesh tone in her highlights as well. Vallejo has something that I’d have used there, but I forgot what it’s called. Now I use similar methods, but I use “sand” tones in the top highlight and use the old Citadel Combos less often. I rarely ever used Bronzed Flesh anyway, but these two being “Barbarian” types I gave it a play on the two models. Also with the F5 models and the Hunter, I used more brown tones than ruddy tones than I usually do to deliberately have their skin tones different to the Vikings and Dwarf Slayers I was painting alongside. Maybe VGC Pale Flesh? That’s the closest I have to a pink tone. Though I don’t have all the Vallejo paints. I used to have Citadels Elf Flesh. Don’t recall having Dwarf Flesh. I remember using the Elf Flesh as a base color and not really liking it. Though back then I thought I could just apply a skin color and magic would happen. I like Panzer Aces Flesh Base right now. With a nice light wash the color turns out pretty good. Yeah, I think it might have been Pale Flesh. Since then, I’ve basically bought all of the Vallejo flesh tones across their different ranges, and then supplement those with various browns, chestnuts (Red Brown/Burnt Cadmium Red) and a whole bunch of the bone/sand shades. And then got flesh tones and flesh washes from a few other manufacturers for good measure. I still need to find some Burnt Cadmium Red, ever since you last suggested it. Have you tried the Panzer Aces Flesh Base? I like it, but it did bubble quite a bit on my test strips, which kind of worries me. 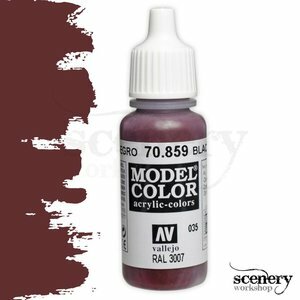 Any decent stockist of Vallejo Model Colour should have it. I’d also suggest grabbing Black Red at the same time, for a darker shade of the same part of the palette. I’ve ordered Panzer Aces Flesh Base. Expecting it any day now. Where is it that you buy from? I tend to use Firestorm Games (Cardiff, Wales) and Arcane Scenery & Models (Nottingham). Cheaper and faster to buy from the UK, even though I live in Australia. Go figure. They are in the states, which is nice. Stock quite a bit of GW and other stuff. Customer service has always been good. I double checked the paint app on my phone, and I did pick up the Burnt Cadmium Red at some point! I think it must have been something else you mentioned, maybe a German Brown/Red? I’m going to be placing another order, probably next month. A few more paints I need (yes, I “need” more paints! ), and hopefully the new Chaos Pitch will be out around that time. Ah, you’re in the States. Yeah, I know Minimarket. I used to buy stuff off them occasionally before the USPS jacked up their international prices to an insane level. At which point I pretty much stopped buying things from the US excepting the odd Amazon purchase.I know all about “needing” more paints. It’s kind of a running joke between my wife and I when I discover a new range and go all in on a ton of pots. Just had these arrive. 2 sets of each. I needed them as soon as I saw them. Yea, I see Australian prices some times and they just seem ridiculous. Especially when shipping is tacked on. The worst I experience is the occasional purchase from Europe. Luckily for most things there are options. I have to laugh at my “paint needs”, because as a ‘painter’ I should be mixing my own colors. I certainly was taught how many timed by art teachers, and I have more than enough base colors. But a big part is laziness and wanting to have the same consistency every time. Consistency and ease of painting are huge factors. We’re not painting bespoke individual pieces on canvas, we’re painting teams, armies, gangs. 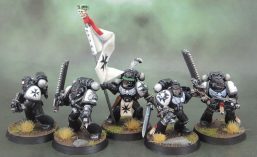 Many of whom wear uniforms and have uniform equipment that may be historical (and so want to match a particular hue) or fantastic – and so still want to match a particular hue (ie Ultramarine Blue, Dark Angels Green, etc) and either way – again, consistently do so. Doesn’t mean we can’t or don’t mix colours, but it’s a hell of a lot easier and quicker to have a formula to paint the things with VMC Light Orange, followed by shading the things with a mix 2 parts VMC Light Orange with 1 part VMC Amarantha Red instead of getting out out 10-pack of paints and mixing each of those things individually each time! Besides, new paints often equal new shades. Sometimes things you haven’t really seen before thet can give new and interesting ideas on how to use them. I call that working smarter. Besides, we’re dealing with small bottles and pots of paint. Buying three shades of red doesn’t save us any money off buying three of the same pot of red, and instantly gives us more options and more consistency. If one can afford it, then there’s no issue. No disagreement here. If I had to mix everything, I doubt I would ever stick with painting miniatures. Unless there wasn’t already mixed paints readily available, and in that case, I wouldn’t know any better. Hm, you have a paint inventory management app? Yea, it’s called “Paint Pot”, on iPhone. Might be an android equivalent. Oh, another thing she likes to do is shake the paints, which is pretty awesome! Doesn’t seem to be an Android version, but it sounds good anyway! Thanks Alex. Looking at them there makes me want to find/dig out another couple to add to them via “slow burn” painting. Beaten to it by the comments of others. Love the tattoo/war paint, the tiger cape and pretty much everything else for that matter! Very cool. I like the pelt cloaks. Nice group. I especially am impressed (but never surprised) by the freehand work on the tattoos. Kudos! Thanks Mark! I need to get back onto those Metal Dwarf Slayers so I can do some more tattoos!